The country girl in me was so thrilled to receive this inquiry. Jenna and Reford wanted a rustic, laid-back, party (the bride’s words exactly) – there was to be no fuss or formality, just a welcoming celebration for friends and family to witness their union. I was immediately impressed upon meeting Jenna. I could tell that she knew exactly what she wanted and she had in fact already completed a good portion of the tasks on her checklist – so there was no need to drag her groom to this first meeting. Side Note: I usually like to tease a groom for not being present at the first meeting (it’s not uncommon!). When I do finally meet him, I love to see the look on his face as I tell him about all the (fake.. hee hee) extravagant plans in place. “Oh, you didn’t know about the fireworks display?”, “What do you mean you aren’t okay with a pink theme?”… It’s a great way to insert some levity and illustrate that this isn’t meant to be a tense time! Joking aside, I was hired to coordinate the day and bring the vision to life, thus allowing this bride and groom to really enjoy their wedding – a greatly appreciated and mutual goal for all couples seeking planning or coordination assistance. 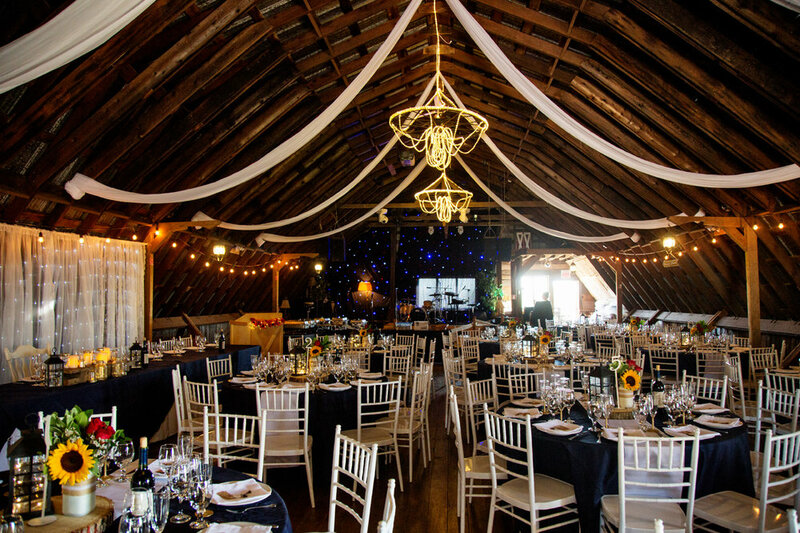 Jenna and Reford wanted to get married in a spot where “less is more”, but without sacrificing charm or character; at the suggestion of the bride’s dad, they chose the Bradford Barn for their venue. This picturesque farm estate is situated on a sprawling country landscape just outside the town of Bradford. For the couple who want everything readily available onsite (i.e. parking, ceremony, photos, reception, dinner, dance etc. ), this venue is a dream. The two-storey building offers an upper and a lower dining area, complete with exposed beams, house draping and rustic décor. I love a good theme and believe every event should have one. It’s a great starting point to draw from when designing and selecting all of those oh so important details and vendors. A rustic-elegant ambiance is one of my absolute personal favourites, lending itself beautifully to an aesthetic dream of varying colours, textures and organic shapes. A quaint country house is an optimal spot or, as in the case of Jenna and Reford - a tastefully outfitted and repurposed barn. It’s a space than can be translated and transformed differently by each couple, and I really love that idea. In the case of Jenna and Reford, rustic meant incorporating a multitude of personal and DIY projects. They had their stamp on just about every focal area of the day - from the signage at the ceremony, to the offering of the s’mores bars, the bridal bouquets, and the hand-written notes on the favours – personalized to each place setting… efforts that would be noticed, acknowledged and cherished by each and every guest. Upon my arrival at the venue, I was greeted by the groom and his groomsmen with offers of assistance left and right. (Who says chivalry is dead? Gentlemen, each and every one of them… you’re all hired!!). The day’s events officially began just a couple of hours later with set-up complete, when the couple had their scheduled “first look” in advance of the ceremony – a new trending choice that I am all for! There is nothing quite like watching two people so crazy in love see one another complete in wedding attire for the first time. It is my privilege as a wedding planner to witness this moment, and of course a photographer is there to capture it. In the case of Jenna and Reford, there were also about 20 other onlookers anxious to see the groom’s reaction to his beautiful bride. (Although Jenna and Reford barely noticed us, not able to keep their eyes off of each other!) 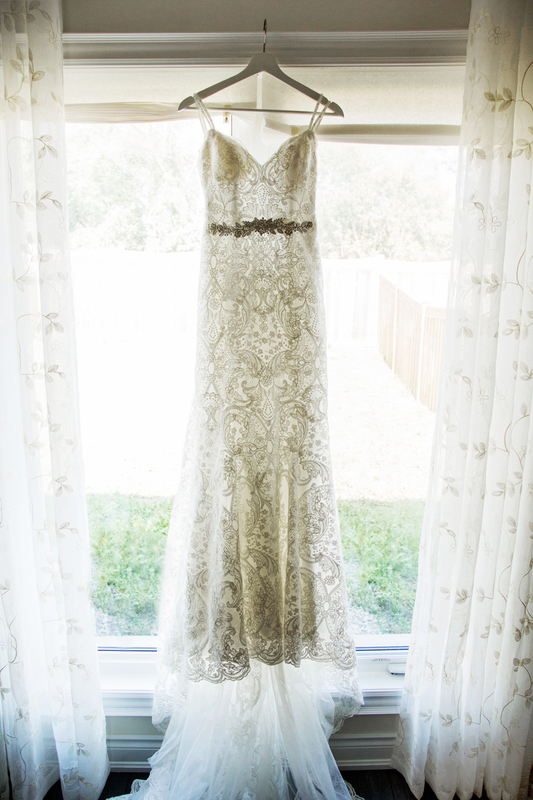 I think it also serves as a great way to calm the nerves as you prepare to walk down the aisle. The late September date provided blue skies and a comfortable warmth, welcomed and appreciated by guests as they were invited to enjoy the outdoor ceremony overlooking the rolling hills of Bradford. Cowboys boots, wood benches and sunflower-filled mason jars lining the aisle set the tone for this country setting – and guests certainly knew they were in the right place! Following the ceremony, guests were led to the adjoining patio where music, lawn games, food and drinks would carry them through to the dinner hour. Guest tables were draped in navy-blue linen with white runner accents and a collection of varying items (lanterns, sunflower filled mason jars, table numbers and menus) to complete the look. The focal point of the reception space was a sheer panel strung with lights, beautifully illuminating the bridal party. It was here also that a “surprise” slideshow was projected, heartfelt speeches were given and memorable first dances were had. Truly special was the touching father-daughter dance, as Jenna surprised her dad with Elton John’s “Can You Feel the Love Tonight” – a song he used to sing to her when she was a little girl. Cue the tears and bring out the band and an outdoor s’mores break at the fire pit (not your standard fare, but an elevated menu offering the nutty buddy, salted caramel and more delectable pairings.. yum!) before heading back to the dance floor and festivities. They say to stop and smell the roses, or in this instance the sunflowers. A little while back and most unfortunately, Jenna’s childhood home burned to the ground, taking along with it the family’s personal belongings and a place of cherished memories. Jenna has always loved sunflowers, and in the days leading up to the wedding she was passing by her old property and saw a single sunflower growing on the lot. It was a poignant symbol that put her at ease and reminded her how important it is to find meaning and enjoyment in what we are doing right now - including the planning process, the wedding itself, and her new life with Reford. Life is indeed precious and is to be savoured.